Francisco Matto received his first painting lessons at home. In 1932 he began to collect pre-Hispanic and Amerindian art that became one of his main subjects of study. In the mid-1930s he became interested in surrealism and wrote surrealist poems and painted surrealist murals. In 1939 he met Joaquín Torres-García. He attended his lectures until 1942, when he became a member of the Taller Torres-García. At that time he participated in numerous group exhibitions and wrote theoretical texts about modern and pre-Hispanic art. In the mid-40s Matto produced still life paintings with flat figures and on fields of primary colors. He also painted harbor scenes, one of which received a prize in the VII Salón Nacional (Montevideo, 1946). In 1948 he made his first wood reliefs, in which he began to combine the aesthetics of constructive universalism with the aesthetics of pre-Columbian art. After Torres-García’s death in 1949, Matto continued teaching at the Taller, except when he traveled to Europe and Egypt (1950, 1954 and 1958). 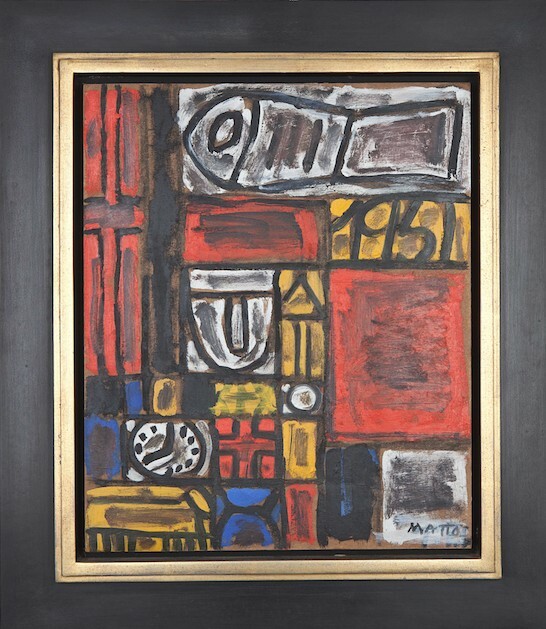 The orthogonal structure and the frontal and synthetic forms of his works, influenced by Torres-García’s teachings and his study of the Amerindian art were constant in Matto’s work, even in the 50s when his paintings became more focused on pre-Hispanic motifs. In 1962 the Taller Torres-García closed and Matto founded the Museo de Arte Precolombino which was based on his private collection. The institution was active until it closed in 1978, due to the lack of municipal financial support. During the sixties, Matto began the series of Tótems and received commissions for murals from public institutions and private patrons. He was also asked to design a coin for the Banco Central de Uruguay (1969). He continued to work on reliefs in wood, marble and cement. In his constructivist paintings, he reduced the presence of symbols, so that the grids were simplified. A similar synthesis of form and color also informed his wooden reliefs. In the 70s Matto created a new series, Tótems, consisting of flat vertical sculptures in wood. They were inspired by the funeral posts of the Mapuches who he met in the 30s. In Tótems the constructivist composition was connected to cosmic and ancestral symbols, used here more prolifically than in his other work. Matto’s sculptures from the end of 70s to the beginning of the 80s, among them Monumento (1979) are large in size. In 1982, he designed a gigantic U in cement for the Paseo de Las Américas (Punta del Este, Uruguay) as part of the Primer Encuentro Internacional de Escultura Moderna, in which several South American sculptors participated. Among his last works was Caritas, a series of small feminine pictures which represented a return to figuration more than two decades after his last harbor scenes.